I just love our newest website for Horizons Consulting. Because this a smaller, business presence site we decided to go all out with a fabulous breathtaking animated slider on the front page. We had a lot of fun with Horizon’s logo, making it rise up on the ocean horizon before a glorious sunset with soft animated clouds. It’s just so serene, peaceful and beautiful to look at, you might want to visit this site often for some stress relief! 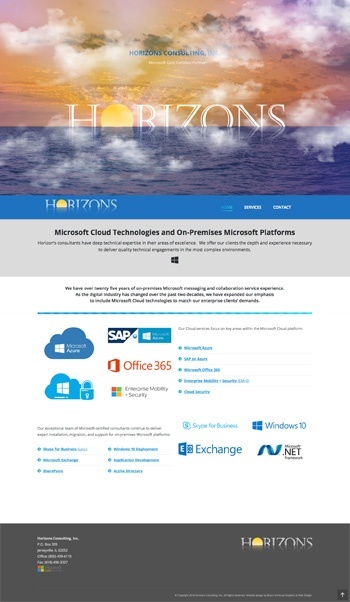 And definitely visit Horizons for help with Microsoft messaging, collaboration, and cloud technologies. They are the experts!